An American Viticultural Area, or appellation, is a defined grape growing region in the U.S. with geographic features (such as soil and climate) that set it apart from surrounding areas. At Villa del Monte Winery, we include the American Viticultural Area (AVA) on our labels since we believe that the terroir of the AVA (local geography, elevation, geology, climate, soil, and microclimates) influences the structure of the grapes. Carneros: Also known as Los Carneros, Carneros is situated on the Napa and Sonoma border on the north end of San Pablo Bay. This area is known for thin soils, sunshine, cool evenings, and little rainfall. The early afternoon fog helps moderate the temperatures. 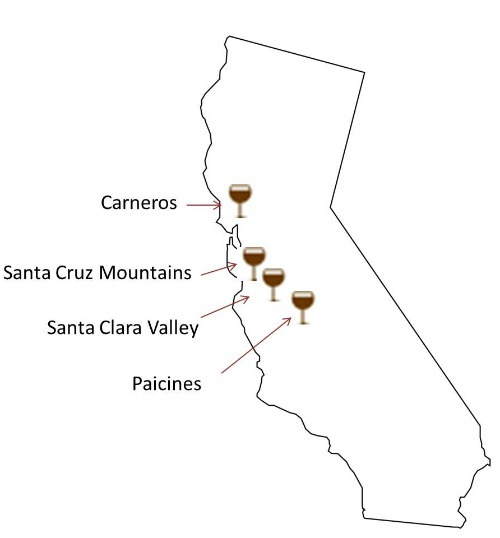 Some of the cool-climate varietals that grow well in Carneros are Merlot, Pinot, and Chardonnay. Our Carneros Merlot comes from the Moon Vineyard, a small 10-acrea vineyard on the Napa River. 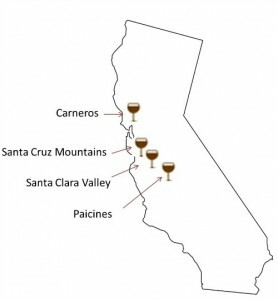 Paicines: The Paicines AVA is located within the larger San Benito AVA, in the heart of San Benito County. Warm during the day, this AVA gets a bit of coastal cooling in the evening. The warmer climate is best suited for growing Bordeaux style wines of intense flavor and complexity, such as our Malbec grapes that come from the Pedregal Vineyard. Santa Clara Valley: Known originally as the Valley of Heart’s Delight because of the high concentration of farms and gardens, this area is now home to Silicon Valley. Days tend to be warm here with moderate to light rainfall since the Santa Cruz Mountains protects the valley from coastal influences. The heat-loving Syrah grape grows well here. Our Syrah comes from the Pasha vineyard, a small vineyard the supplies only two wineries with grapes. Our Chardonnay and some of our Pinot comes from the Regan Vineyards in the Corralitos area of southern Santa Cruz County. This 50-acre vineyard sits on a hilly knoll at about 400’ elevation and benefits from cool breezes off the Monterey Bay. We also get some Pinot Noir and Cabernet from small, private vineyards closer to the ridgeline at about 1500’ feet. Come by the winery on one of our wine tasting weekends and we can tell you more about these AVAs. Over a glass of wine, of course!